There are a few things that help your guitar give you many years of pleasure. I will add more details to this page as time goes by. Humidity control. This is crucial. Just like humans, guitars and other musical instruments are healthiest living between 40% and 50% relative humidity. I have seen others who suggest higher numbers, but I doubt they have ever visited the Southwest. The key is to try to keep your instrument in a stable state of humidity. This can be a challenge. Relative Humidity varies enormously. In dry places like Santa Fe, we see it drop below 30% RH on a regular basis. Average high relative humidity in places like Tampa or New Orleans is over 70%. Well made musical instruments without protection cannot sustain this variation without signs of movement and often damage. 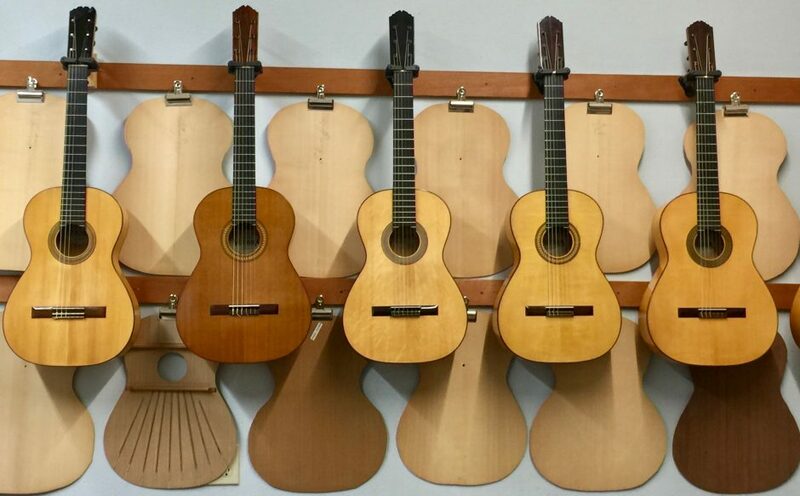 We see frets sticking out of fingerboards, loose binding and cracks on one extreme, back-set necks, loosened joints and swollen soundboards on the other. Dramatic changes in a short time are the worse. An inexpensive hygrometer that has been calibrated is a good investment for your guitar case and equally or more importantly, for the room where your guitar is being played and stored. If you are using a chap-stick or lotion, it is a good sign your guitar is dry. Gradual increase in humidity is not particularly worrisome. Guitars can be designed to accommodate the expansion of certain components without any damage done to the guitar. Extreme heat and humidity on the other hand can loosen glue joints and may permanently distort the shape of your instrument. NEVER put your guitar in the trunk of a car during the day. It will die. Don’t do it. Avoid direct sunlight as well. Before I moved to Santa Fe, New Mexico, I could not imagine nor comprehend the dryness here; Other places in the world are similar. I would throw a little water on my shop floor during the Santa Ana winds, and that was about it. Building between 50% and 60% seemed reasonable. It was not. For the last 30 years I have been building between 40% and 50%, depending on the task at hand. 1- Humidify the room in which your instruments are stored. If your guitar and case are the only things humidified in the house, then they become the humidifier for the room in which they are played. My personal preference for a room humidifier is a Venta LW45. It has a large water capacity which means you will be spending less time filling it. It has no filters to replace. It is easier to keep clean than most. It does not produce the fine white mineral dust that other humidifiers emit. There are other much more affordable options. Any thing is better than doing nothing. 2- If your floors can be mopped, this is a quick way to raise the humidity on dry days. When hanging wet clothes in the laundry room or bathroom, put your guitar in there with them. If there is space in the bathroom while taking a shower or a bath or even after getting out of the shower or bath, let your guitar and case soak up a little moisture. These are some examples of opportunities to give your guitar some humidity even if you don’t have a controlled room. 3- Evaporative coolers are your friends. If you live in the southwest or other arid environments, a swamp cooler aka evaporative cooler is a great way to both humidify and cool your home. They are economical. You can use a portable version and park it in front of a window. 4- Use humidity devices inside of your guitar and case. I prefer Boveda 49% humidity system. When humidity drops below 45% they emit humidity, when it goes above 49% they absorb humidity. On a side note for those in a humid environment, Boveda also has high absorption 49% humidity packs. These work better in conditions where you are concerned of over humidification. 5- When playing in dry venues (or rooms), keep your case shut with the humidity packs inside. You do not want to humidify the venue with your humidity packs. In between sets, put your guitar back in the case with the packets. Nor do you want your guitar to become the only humidifier for the room. If you have a well sealed case and use only the humidity packs, your guitar will be okay. You do need to check them periodically and replace dry or hardening packs. The packs last much longer if the room where the instrument is stored is also humidified. In extremely dry conditions, I find using a damp sponge or other source of water inside the case can extend the life of the packs. This is contrary to the manufacturer’s suggestion but my tests suggest this is helpful. If the packs become too bloated, then the added humidity source is not needed nor recommended. A pack that gets to large can leak. Playing outdoors in dry conditions: It happens. If the humidity is below 40%, it is going to be hard on your guitar. It’s a good venue for less susceptible instruments that I will talk about later. In brief, cedar and redwood tops are less likely to crack than spruce. This might be an argument for torrefied wood as well. There are a few suggestions that will help some. Pick a shady stage, near water if possible (a pool, a pond, a stream, lots of big flora). Do two or three short sets instead of one long one if possible. Put your guitar in its humidified case in between sets. The truth is, there are some environments that your guitar will not be able to tolerate for more than 45 minutes to an hour at a time. I have built instruments with the great outdoors in mind. Not all guitars, even mine, are designed this way. As a footnote, Having a hygrometer with which you are familiar is a good idea. I have spent from $10 to $300 on hygrometers. The fancy ones work no better than the less fancy. They all need some calibration. If you have a hygrometer, check its accuracy by doing the following. In a plastic or glass container with a lid, place a cup or so of table salt. Add enough water to saturate the salt. Put your hygrometer inside the container and close the lid. After about an hour your hygrometer should read 70% RH. If it reads high your hygrometer is telling you your guitar or room has more humidity than it actually does. IF it reads low, then you are not as dry as you thought. Either adjust your hygrometer or your mind to understand the number you are seeing. (Not my choice, but If you choose to use Dampits, Herco, Oasis, or a damp sponge in a baggie punched with holes, take a little extra care to make sure they are properly dampened, not too wet, not too dry, and be careful that they do not drip inside of your guitar causing mold and other problems.) One thing I do see are those trying their best not to let their guitar dry out and crack; they accidentally over humidify usually with one of the methods I just mentioned. This doesn’t occur when being careful or when using the humdity packs from Boveda. I should also include Planet waves system as well, their supplier for the packs is also Boveda. Over humidifying is a different situation than guitars living in extremely humid conditions on a regular basis. I have shipped instruments to various corners of the planet. One of the wetter ones was Barbedos. My client assured me he had a de-humidification system for his studio and basically had the opposite battle we encounter in arid places. As we struggle to get things above 40%RH, they and others struggle to get things below 60%. Anyone who lives in these conditions does not leave bread out of the refrigerator or it turns to a moldy mush. I would suggest a similar yet inverse approach. Invest in a small de-humidifier for the room your instrument will live in. Use the Boveda high absorption 49% two way humidity control system. Put your guitar in the case to let the packs help keep your guitar in the 45% to 50% range as much as possible. As I mentioned above, the extremes in this direction tend to swell tops, loosen glue joints, especially binding, purfling, and bridges. And one has to contend with mold and altered action and playability. One also needs to clean guitars more in this condition and try to keep hardware from oxidizing and deteriorating.